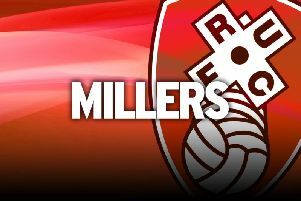 Chairman Tony Stewart has set his sights on a quickfire return to the Championship if bottom club Rotherham United suffer relegation this season. The Millers are 15 points adrift of safety with only 16 matches remaining and staring the drop in the face. Stewart, who financed the club’s two-year rise from League Two to the second tier, says money would be in place for an immediate promotion push. “I’d be confident because the budget has never been low in League One,” the owner, who refuses to give up on an unlikely survival mission this term, told The Star. “We were in there for one season and we’d got one of the top four budgets. We would have a quality of team capable of doing well in League One. I’d be disappointed if that wasn’t the case. The budget next season in League One would be one of the top four again. Stewart says he has a duty to Rotherham to keep believing in a second great escape under caretaker manager Paul Warne after Neil Warnock’s amazing achievement last season. “There are 16 games to go. The bookmakers would write us off,” he said. “But, as chairman, I have a responsibility to make sure we do our level best to stay in the Championship, even if the odds are suggesting something different. “It’s mathematically possible to stay up. Is that going to be difficult? Well, it’s not going to be a walk in the park. If we fail to do it, what I can live with is that we’re a better side at the end of the season than when we started it. Meanwhile, new boy Ben Purrington is set for his first Millers home game on Saturday, against Blackburn Rovers, after making his debut in last weekend’s 1-0 defeat at Bristol City. Purrington, who turned in an assured performance after signing from League Two Plymouth Argyle, said: “You can tell the difference in quality and the physical levels between the divisions, but I thought I did okay. “There are a lot of points still to play for and stranger things have happened than us staying up. If we get a few wins, the mood changes in the camp.